【Compatibility】Support IR and RF 433MHz to control devices such as TV, Air condition, DVD, curtains, table lamp, humidifier, temperature sensor etc. 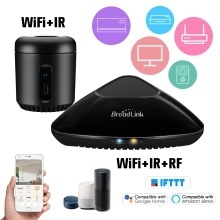 【APP Control】Control IR and RF appliances with "Broadlink" App via internet anywhere anytime, making life smarter and more convenient. BroadLink RM Pro support Wifi 2.4GHz b/g/n, 3G and 4G control by Android/ IOS system. 【Voice Control】Smart universal remote control compatible with Alexa, Google Home to voice control your TV, air conditioner and motor curtain, etc. 【Timing Function】Set up timers to turn on/off appliances at a specific time. You can set the boot time of TV/Air condition/DVD in advance. 【All in Your Hand】Turn all IR remote controllers into one APP, never get into a mess. Support auto modes, AUTO HOME and AUTO AWAY (Auto Away Function is only available on android phone). 【Compatibility】Support 50,000+IR (38KHz) controlled devices such as TV, Set-up Box, A/C, Personal Video Recorder, DVD, receiver and more. With large IR data base which covers 98% IR remote function. Supported devices library is constantly being updated by the cloud so your RM Mini3 is always compatible with newer devices. Option to program your devices features if certain cloud data is unavailable. 【Voice Control】Compatible with Alexa, Google Home to voice control your TV, STB, Air Conditioner and Fans. 【Timing Function】Set up timers to turn on/off appliances at a specific time or customize scenes with multiple devices. 【All in Your Hand】Turn all IR remote controllers into one APP, never get into a mess. Support scene mode and sleep mode.